Calvia Villa is the administrative centre of Calvia municipality and is one of the wealthiest areas in the whole of Spain. Still, it is far away from the coastal tourism developments and attracts visitors and second-home buyers with the atmosphere of tranquility and rustic charm. Calvia Villa property owners can make the most of this secluded environment and enjoy traditional Spanish living. 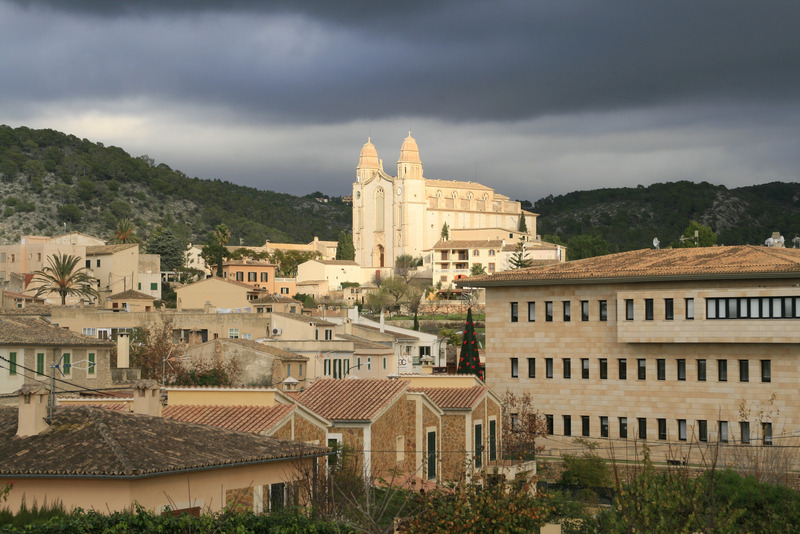 Calvia Villa itself is a typically rural and well-kept Mallorcan town. The honey coloured properties overlooking the landscape with the magnificent scenery of the cosy Sierra de Tramuntana is a perfect place to live in. The valley surrounding this area is of steady and harmonic beauty. Here you find pines growing in the high parts and orchards of fruit trees and vegetables. Prices on Calvia Villa property market are significantly below the municipality’s norm. For example, the average price for a house in Calvia Villa is around 80% lower – Average price per sqm. in Calvia Town and Surroundings €3,836 -1% properties#: 120 last change on: 19 Apr 2019 €3,836 although a sea view position increases the average price per sq. metre. Price for an apartment here is Average price per sqm. in Calvia Town and Surroundings €3,483 0% properties#: 27 last change on: 19 Apr 2019 €3,483 on average. Investment opportunities are currently available at Average price per sqm. in Calvia Town and Surroundings €1,920 0% properties#: 2 last change on: 19 Apr 2019 €1,920 per square meter. Real estate agencies that offer the highest number of listings on Calvia Villa property market are Balear Invest, GC Property and Imperial. Once it was mainly an agricultural town, but now Calvia Villa has become a popular residential area with around 3,000 inhabitants. It is just a short hop from the coast and fifteen kilometres from Palma city. Though Calvia Villa is situated in the interior of the island, its advantageous geographical position just in the south of the mountain range also brings milder and sunnier winters than experienced by other neighbouring areas. There is still a touch of Old World charm about Calvia, mainly because of its historical heritage, which can compete with many other larger areas in Spain. It is first mentioned around 2000 BC when sailors coming from the Middle East stopped here on their way to Iberia. Romans settled in Calvia Villa in 123 BC, which is evidenced by the remains of the Roman villas. Generally, there are no grandiose buildings on the town streets, but some charming houses with small front porches. In the pretty lush countryside, which is minutes away, among the cultivated fields you will find beautiful country houses. Some of them are even resembling palaces, which once were the properties of the nobles and landowners. In the heart of the town, you will find its main historical landmark – the church of Sant Joan Baptista, majestically looking down over the town and beyond. This historic temple with slight twin towers and the bell tower is notable with its preserved old Gothic façade and touches reminiscent of Rome. In addition, today’s Calvia has an abundance of lifestyle choices to offer both the visitors and prime residents alike. For those interested in boats and yachts, or just to have some relaxing time in the upscale and laid-back atmosphere, within a 10-minute drive east, you can enjoy the luxury lifestyle of Puerto Portals. If you head in a westerly direction, you can visit Port Adriano, the newly designed marina by Philippe Starck. And just further along, you will find the charming fishing port of Port Andratx. If golf is your sport of choice, there are a number of splendid golf courses in striking distance of Calvia Villa, such as the Royal Bendinat, the Poniente and the three golf courses of Santa Ponsa. Being a home to the region’s town hall and administrative offices, Calvia Villa also boasts a sports stadium and a modern sports centre incorporating Olympic size swimming pool. The town is also conveniently located from the beaches of Puerto Portals and the resort area of Palmanova, which is offering diving, water-skiing and sailing. There is a number of good restaurants where you can enjoy both Majorquin and international cuisine, as well as a handful of interesting bars. There is also a great traditional market held every Monday, which boasts a wide range of typical products of the region, such as food, clothing, and traditional craftsmanship. The historical heritage of the town is also shown in its celebrations. The most notable festivity in Calvia Villa is the summer holiday of Saint James, which is featuring the whole week full of different cultural and sportive events. Saint John the Baptist is another holiday, which has been celebrated since 1950 to honor the senior town’s residents. It involves masses and regional dancing, as well as anyone of over 75 years of age, is invited to have a dish of almond ice-cream. All this unique traditional charm and natural beauty of Calvia has made it a popular area with the wide range of prime second home buyers coming from Europe, who choose to live here.